We charge only the actual cost of shipping and packaging. Most of our products are shipped via USPS Priority Mail, which has proved to be the most reliable and timely method of shipping to the Lower-48 and most of Alaska. Use the chart below to calculate the postage. Orders over $50.00 will be insured. Any overpayment of postage and insurance will be cheerfully refunded. Porta-Heat wood burning stoves, tents and tipis are shipped via UPS to destinations in the Lower-48 or by truck to Alaska. Black powder and other hazardous materials may not be shipped through the United States Postal Service nor may they be shipped via air carriers. We provide free delivery of black powder anywhere inside the Fairbanks North Star Borough of Alaska, except within the city limits of Fairbanks. 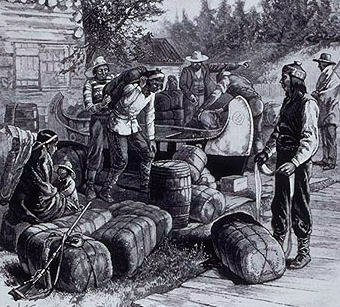 Black powder and percussion caps can be sent to most communities in Alaska, including the Southeast Region by truck or barge with shipping charges billed collect to the customer. To purchase black powder or other hazardous materials these items, see the information printed here. If you prefer shipment by other methods, including parcel post, please contact us and we'll try to accommodate your wishes. Like most vendors serving America's living-history community, Nor' West Company is a part-time business and our operation must accommodate other obligations, especially Swanny's full-time job at a remote industrial facility. We can usually ship your order within 2 weeks of receipt and generally ship much sooner. If we are unable to ship your order in a timely manner we will contact you as soon as possible to determine your wishes. If shipping will be unduly delayed we will cheerfully provide you with names and contact information of recommended vendors in the Lower-48 who can provide the same or similar goods more quickly. We try to keep most of the items listed on our web-site in stock but many historical reproduction items are hand-made by the craftsperson one at a time upon receipt of the order from us. Please allow 6 to 8 weeks for delivery of items listed as "special order" on this web site. If your order will be delayed for any reason we will contact you for further instructions. Because limited edition prints must be handled very carefully to preserve their value, they are shipped directly to the customer from the artist's publisher by UPS. We've had wonderful success shipping these very valuable items in this manner. If you don't have UPS or FedEx service available, we will take special pains to make sure you receive your prints in perfect condition as quickly as possible. Please contact us for current shipping charges for fine art prints. Whenever possible, Nor' West Company uses recycled packaging materials. This not only helps protect the environment, it also helps us control packaging and handling costs.